Well they say that’s true? I tried blogging a few weeks ago and wasn’t able to do anything as I was getting timed out?! Come to find out my router was not recognizing my password, so after a phone call to the help desk, the young man walked me through a reboot and a reset. Just like new! But then I didn’t have time to blog as I was headed out of town in a few days. So now I thought I would give it a shot and this format I use, always had an automatic save…well not tonight! I was trying a new way with loading pictures and well need I say more? It all disappeared! So I am hoping that the 3rd time is really the charm! Last time I left you, we were talking New Years resolutions…well I was anyway! I have finished 2 strawberries and 2 ornaments so far. 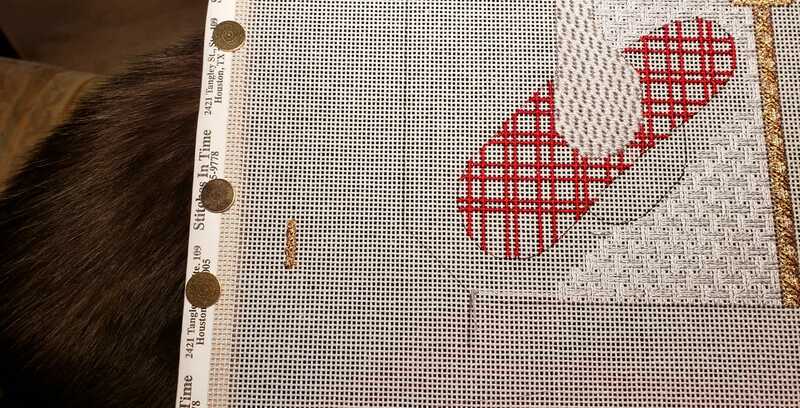 I am working away on my piece that Tony Minieri designed for us on our stitching trip to France last year. 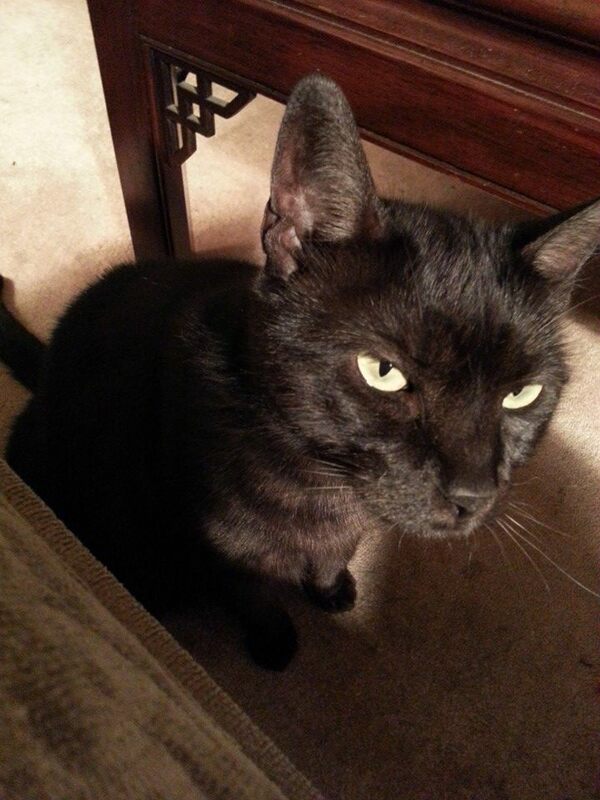 You might notice that I am being properly supurr~vised by AlleyCat. 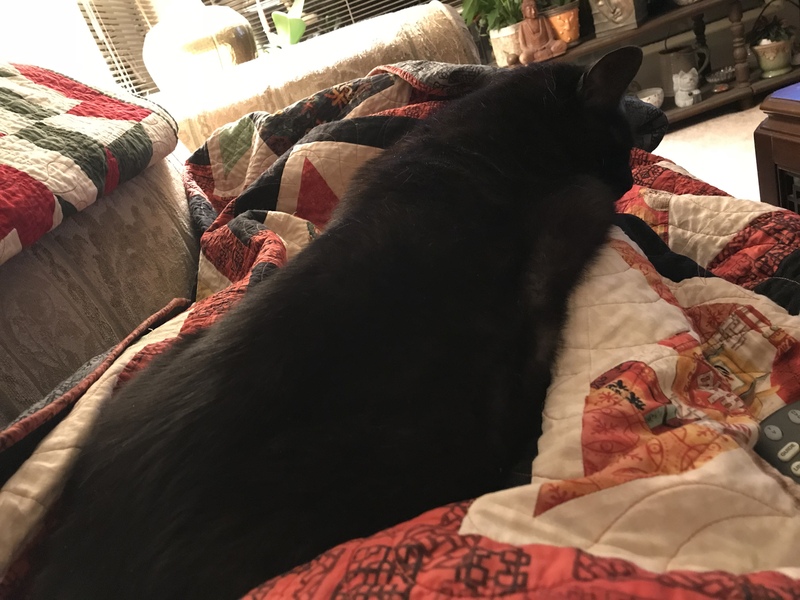 She really is very good and just sleeps on my lap, doesn’t bother my threads, but just don’t move! I am working on this quadrant with the hat which was our “Souvenir de France” of the hat factory that we went to outside of Toulouse, France. This is the entire piece. I would love to finish this before we go back to the south of France at the end of May. 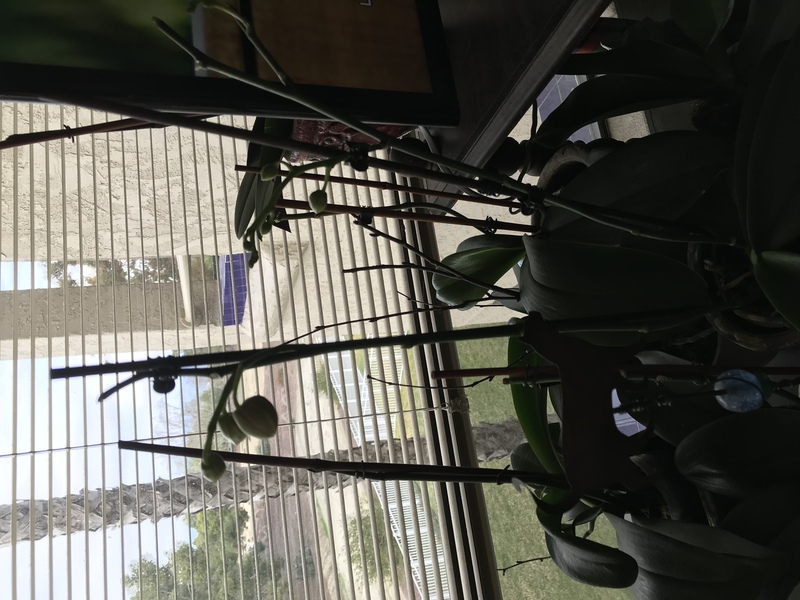 My other resolution was hoping that my orchids would rebloom and they have sure been doing that! I can really take no credit for that and will just thank Mother Nature. 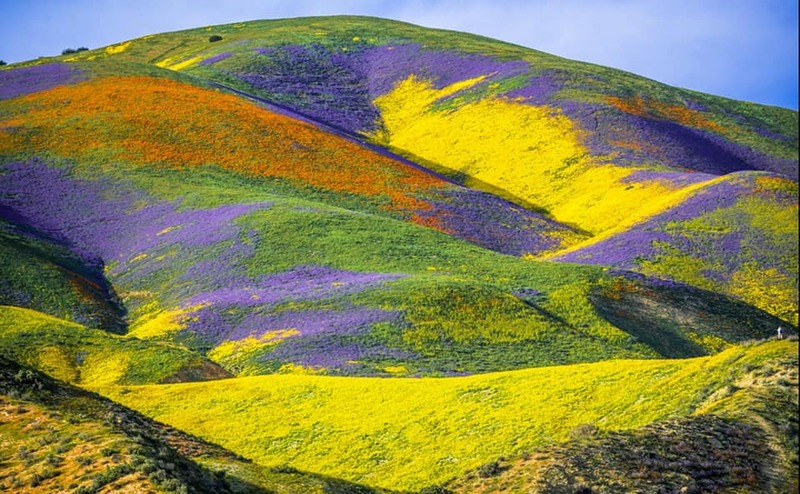 Speaking of Mother Nature, take a look at our super bloom! 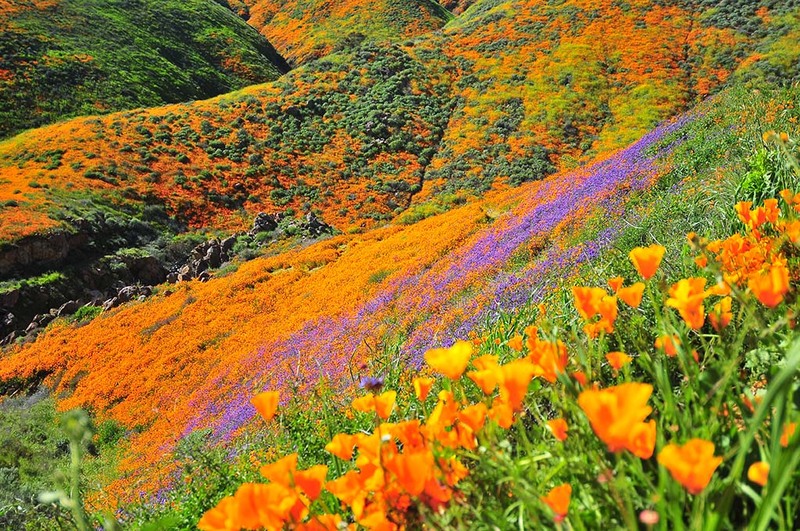 Just magnificent isn’t it? That’s thanks to all the rain we had! AlleyCat send her best meows to you! How’s your New Years Resolutions doing? I’ve given up saying that I’m going to lose weight, save more money, blah, blah, blah. How about you? 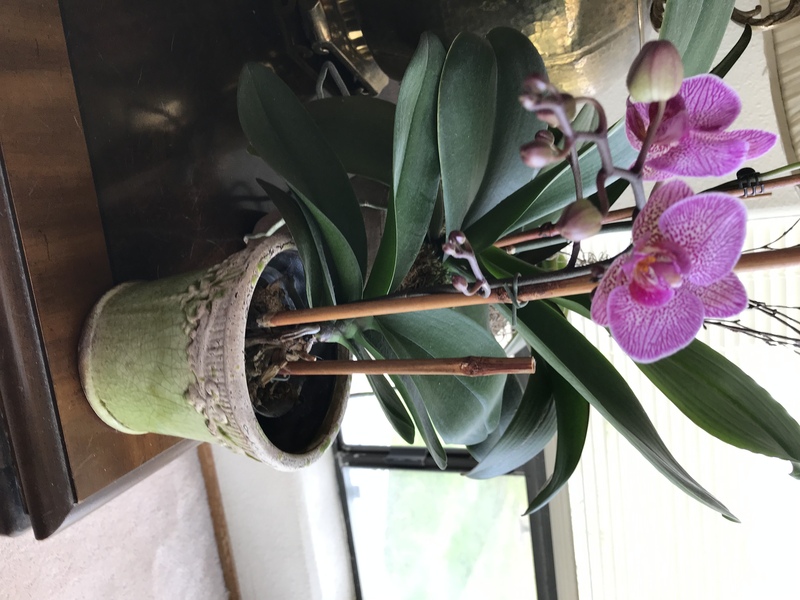 I want more blooming orchids! And it looks like I have a few that are going to do just that soon. After following a feed on Facebook with many of my stitching friends that set their sights on wanting to finish 19 projects in ‘19, I became motivated! I wish them happy stitching and hope that they make their goal. I know that there is no way I can do that much with as much as I work at the shop. So I’m going for 9.5 in 19. A mixture of ornaments, strawberries from Barbara’s Needlepoint in South Dakota and a few of my large pieces. 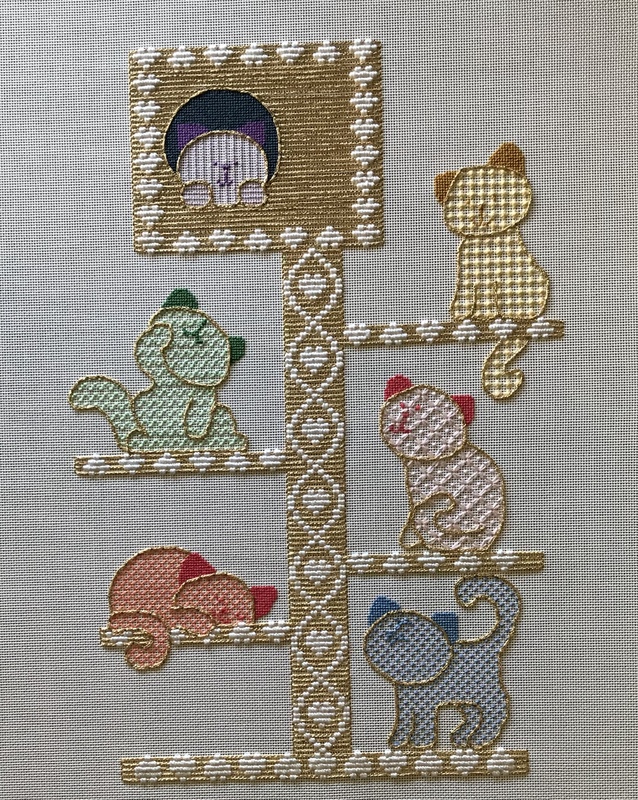 Including Bastet the Cat that I started ages ago and closest to being finished, the Perfume Bottles with stitch guide by Susan Portra, Merrybright Emporium with stitch guide by Sherry Bray and last but least is the piece that we started stitching with Tony Minieri in France. AlleyCat was hard at work supurr~vising today as I was working on a stitch guide for the shop. I just really need more time in my day. Maybe that could be my New Years resolution?! To create more time in my day. I really manage my time well and don’t waste much of it. 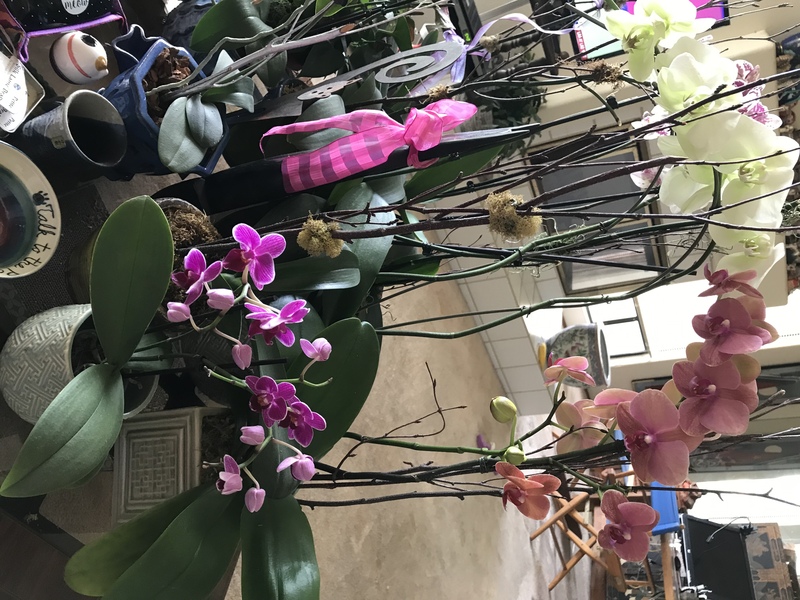 Let’s see this morning I went out to breakfast, came home and moved my Christmas from the house into storage, shopped for kitty food, paper supplies, came home and did housework, laundry and watered the orchids. 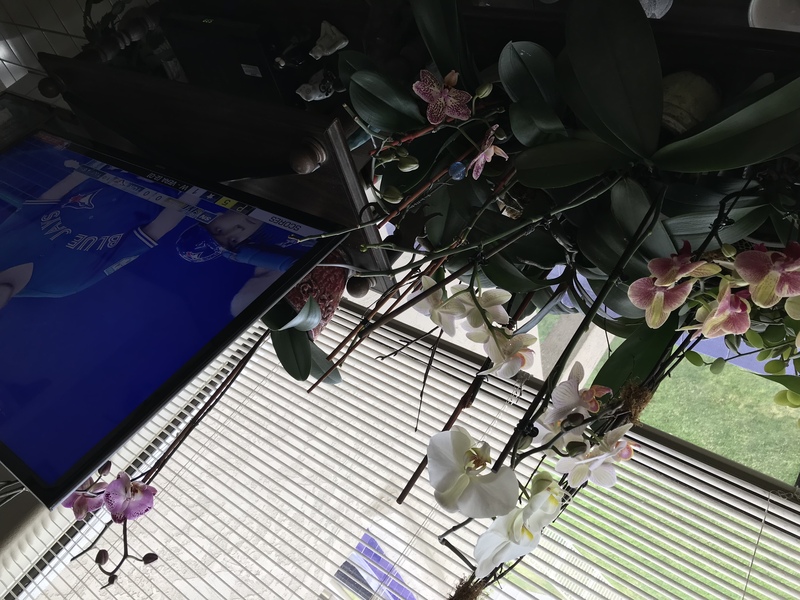 A few had to be sent to orchid heaven as one was overwatered and the other was getting “stuff” on it, and didn’t want it to travel to the others. Plus this is a good excuse to buy a few more! Now I’ll settle in for a night of stitching and tv watching. This is when it’s that time of the year to say that I’ll see you in a few months. First headed to Oregon at the end of the month for my birthday weekend, then it’s off to Blue Bonnet stitching retreat a few weeks later and to end up with our big event at the shop, so no time to blog. They’ve, or should I say WordPress has changed the way my blog functions, well for me anyway, so it’s been somewhat challenging as I stumble through it. I guess maybe if I blog more, it will become easier for me. Maybe that should be one of my New Year’s resolutions?! What do you think? Do you have any resolutions yet? I’ve been reading lots of ideas on Facebook, where as one was “19 in 19.” Nineteen new or already started, needlepoint that is, in all sizes. Depending on what you pick, that could be very aggressive or a snap! I’ve got 4-5 ornaments that are close, so that would give me a great start. I would love to finish the piece that we started in France with Tony Minieri, but then for me it always depends on the shop and how much I work. Speaking of finishes, this was my latest larger than an ornament piece! 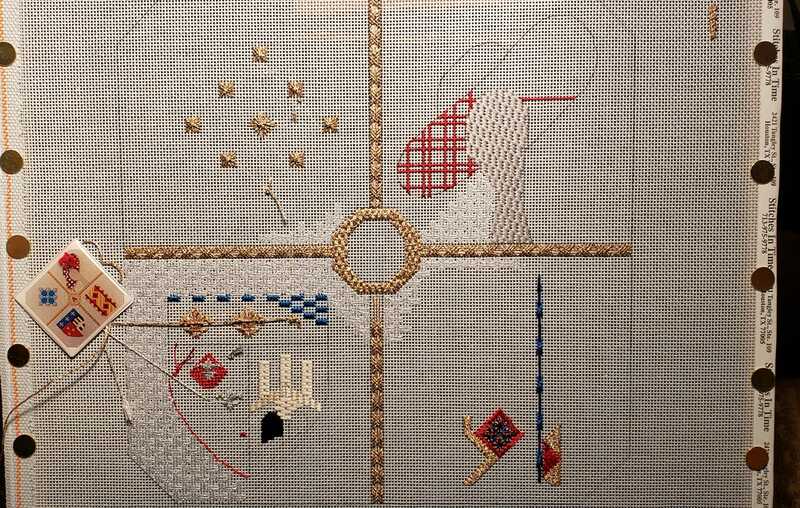 It is a charted design that was in Needlepointers magazine about 10 years ago by Chottie Alderson. 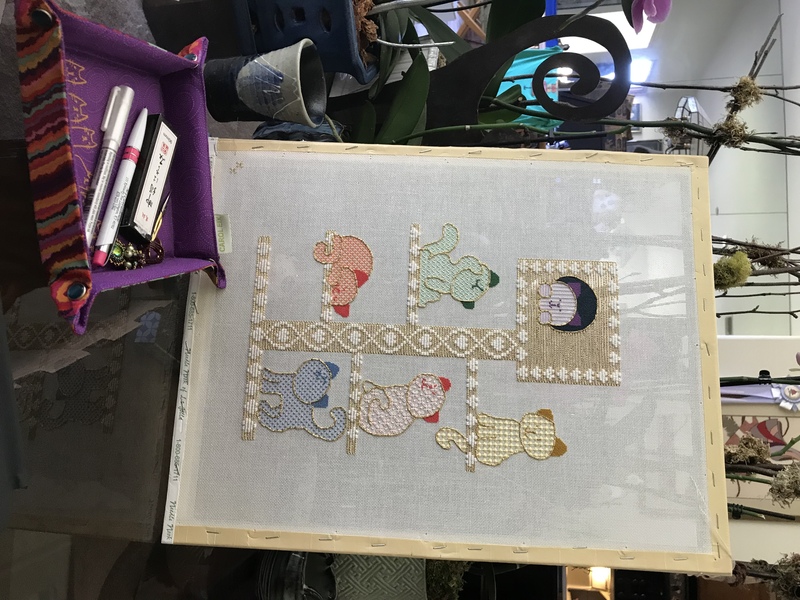 It was piece that I always wanted to stitch and when I stumbled on it in the Needlepoint Nation Stash Exchange on Facebook, I snapped it up! I thank the stitcher for parting with it and it has found a very good home. 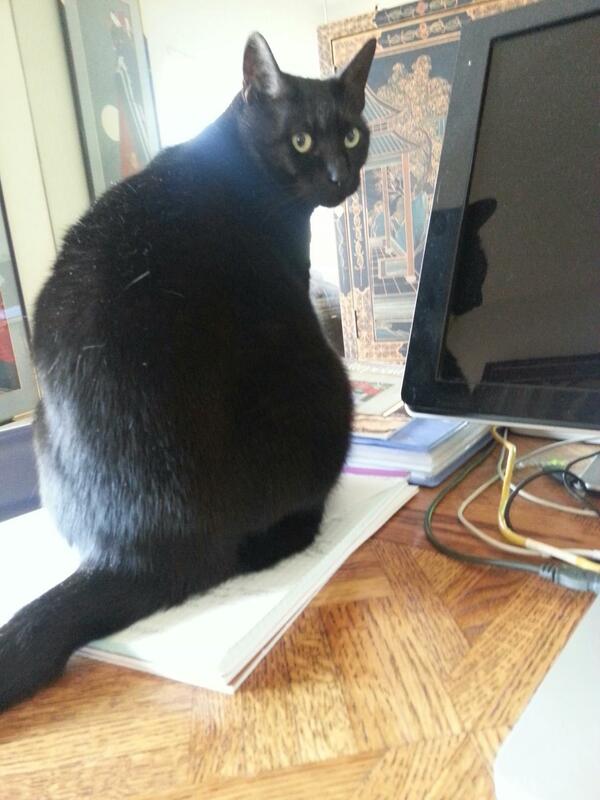 My stitching assistant all settled in with me for some stitching time. 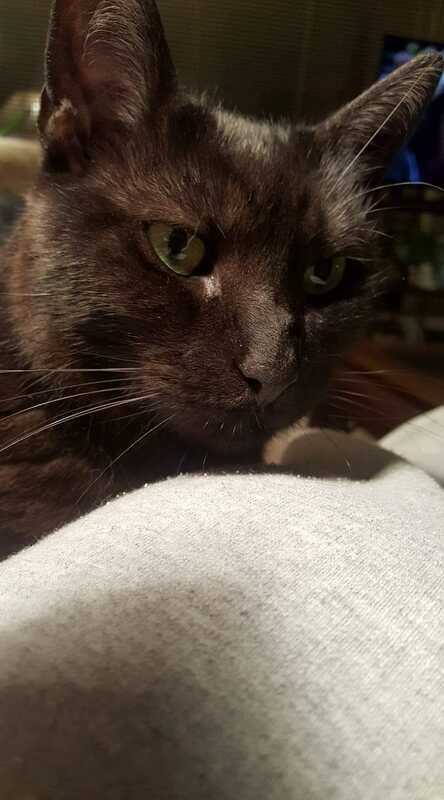 AlleyCat and I both wish you a Happy New Year and here’s to great stitching in 2019! Well I do! Not in the actual person of Santa Claus, but the feeling that he brings. Yes I do understand what the reason of the season is all about, but I love the lights, the decorating, the gift giving, getting to see my sister and family! and the Feast of the Seven Fishes on Christmas Eve as my brother-in-law Michael goes all out. This too will be the first time in maybe 15 years that both of my nieces will be home for Christmas! Usually my sister and I go into a cookie baking frenzy, but I’m thinking this year there may not be time based on when I get there and my nieces arrive. Well maybe next year we will bake twice as many! I love decorating, but once I’m finished with the shop, I really don’t do much at home. Not that I’m a Scrooge (actually far from that!) but there is just no time or energy. So I guess since I’m not putting up a tree, I won’t have to worry about herself knocking it over! 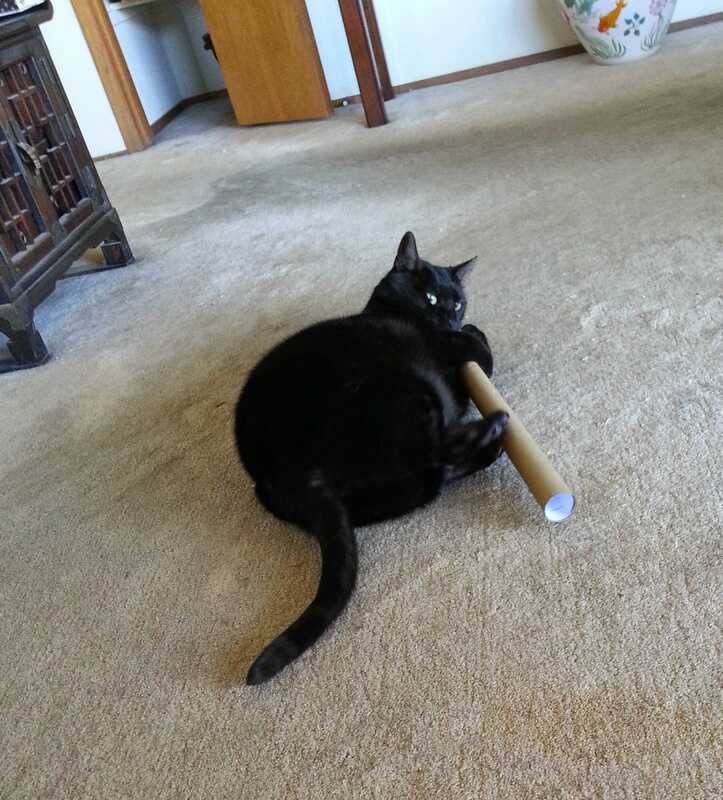 This is herself, better known as AlleyCat having way too much fun with the empty tube from the wrapping paper. She absolutely loves and makes me laugh with her bunny kicks! Such a silly girl she is. Speaking of wrapping, all of my gifts this year, well lets say 99% were purchased on my trip through the south of France and Paris! I sure did lots of reminiscing as I wrapped remembering what a fabulous trip it was! 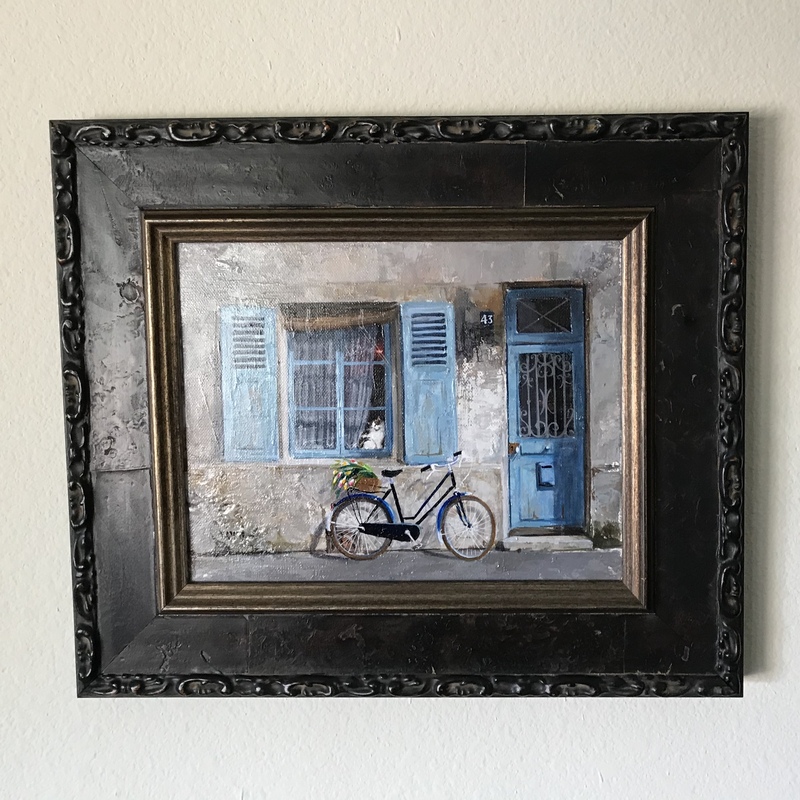 This oil painting was a present to myself which is so Paris, between the bicycles and the magnificent doorways. And of course with the cat in the window, I just had to have it! I bought this when we visited Montmartre, a highlight of the trip in Paris! I actually knew ahead of time where I wanted to hang it. 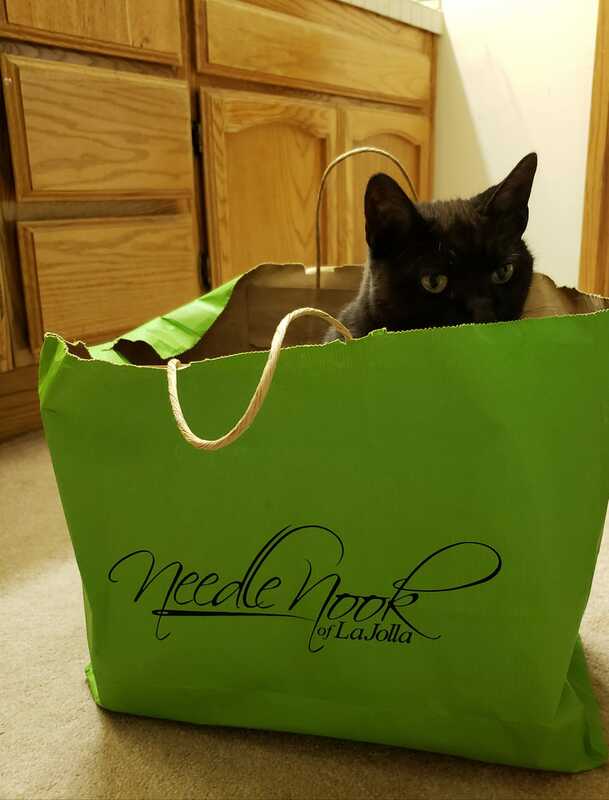 Just a purr~fect fit and it’s right across from my stitching spot! Here’s hoping that Santa brings you everything that you wished for this year! to give thanks. For all we have, family, friends, my AlleyCat, stitching and so much more. This picture of said cat was just of several that I was able to capture that day as she was… and to this day I’m still not sure what she was up to? 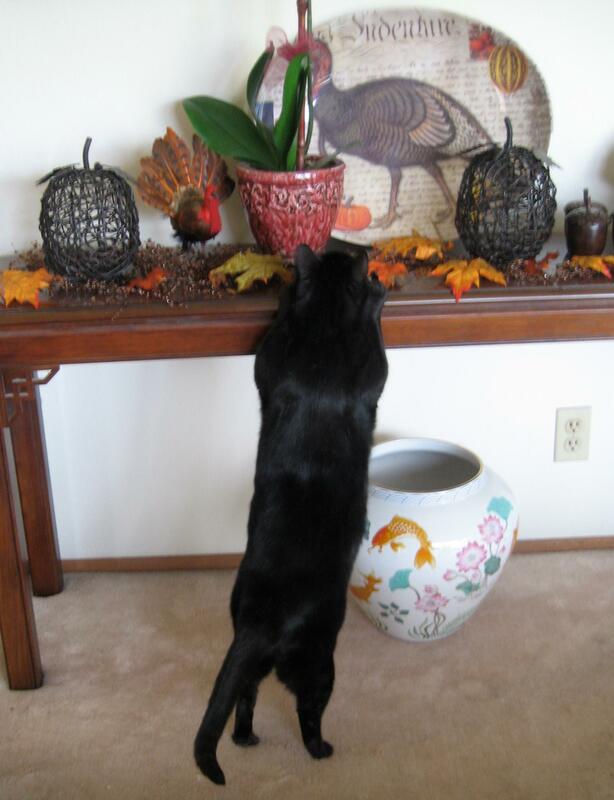 She started at one end of the table and worked her way down, all the while never trying to jump up on the table! Another to add to be thankful for list, is all of you who come in the shop and comment about my blog, or lack there of. I have great intentions, but I really do work way too many hours and just run out of time! Speaking of blog reading, have you discovered Jonathan’s blog yet? https://jonathansembroidery.blogspot.com He attends ANG seminar with his lovely wife JaneBeth mostly when it’s being held on East Coast or even Midwest. It’s a long flight from Scotland! I’m envious as he was able to see the amazing collection of samplers from the Leslie Durst collection at one of the museums in Scotland. What are your plans for Thanksgiving? For those of you have followed me for years, know that I normally go to Missy’s for the big holiday bake-off…but not this year. I’m headed elsewhere to combine Thanksgiving and celebrating Betty’s 100th birthday! Yes! She’s sharp, still stitches and lives by herself in her own home…now if that’s not something to be thankful for, I don’t know what is! 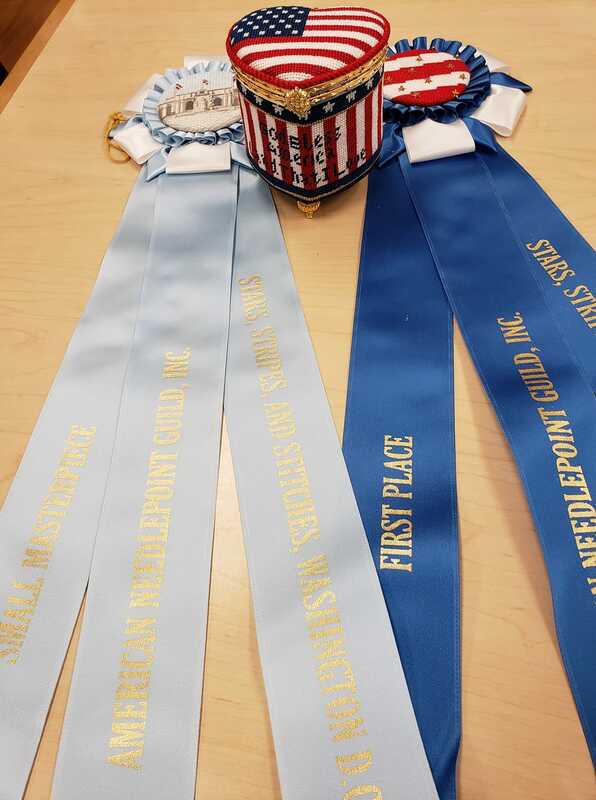 If you get Needlepoint Now …and why wouldn’t you? Make sure you read Elizabeth’s “Musings” which is all about Betty. I guess I’ve rambled on enough and I need to get moving as I have lots to do before I come home to start packing! 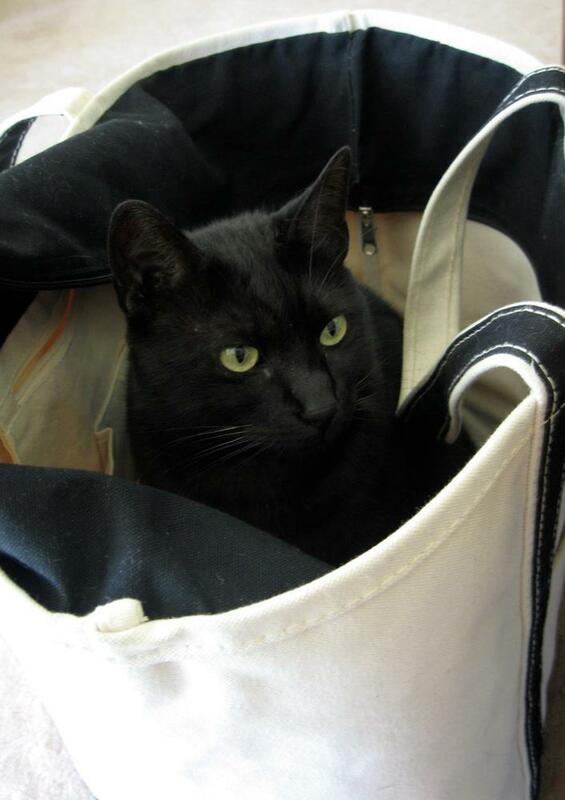 I usually bring these used bags home from the shop for recycling… do you think she counts as that? Only kidding! Happy Thanksgiving to you! Do you? I do and use it extensively especially when trying to find specific beads, thread color conversions, an elusive canvas and more! Did you realize there are Google maps, Google photos, Google classroom, Google translator, Google currency converter, Google doodle, Google email and so many more! So where am I going with this? Previously when I took pictures with my phone, in order to get them to my computer for my blog, I would email them to myself (being that I don’t have an iPhone.) Then my IT guy at the shop started me using Dropbox. Then, when I bought my last phone, the guy at the Verizon store set me up for Google photos. So now it’s just like magic that all my pictures are right there or should I say here! Like this fabulous picture that I took in Trader Joe’s of their sunflower display. When driving through the south of France we would see miles and miles of sunflowers, so I just had to bring home a bunch. Speaking of France, I bought this little jar at one of the “brocantes” or flea markets that we went to. My idea was to keep it for my orts from my France piece. The oil painting was purchased the day we went to Mountmartre in Paris. It was really a very special day and this piece really spoke to me. The bicycles, the doors that are very significant and of course the cat in the window. I really do understand now why everyone loves Paris! So know that I can access my pictures, I will try to blog a bit more…but it will be awhile. We have 3 weekends in a row with classes at the shop, so I’m a little busy to say the least! And why did I do it this month, during playoff baseball…what was I thinking? AlleyCat and I say we’ll see you later! American Needlepoint Guild Seminar in Washington DC was a world wind of stitching with friends, visiting, chilling and dining out with an international flair. Cuban, Chinese, Japanese, Italian, Lebanese and American! More about seminar later. So I came home to work and repack like a fool and now I’m at the airport again waiting for my British Airways flight to ??? Well after a layover in London, I am onto Toulouse France where I’m embarking on a stitching week with none other than Tony Minieri. Our week was put together by Frances Jue who owns Stitches in Time shop in Houston. I never thought this day would get here…and well AlleyCat is probably very upset with me by now. So by now this should be finished, but it’s NOT! I wasn’t happy with the middle cat on the right side. Take it out? or leave it? you know when you leave it and after it’s framed, you will question your decision every day! Right? I had a few of my stitching friends try to talk me off the ledge, but I did find a mistake in the pink stitches. Of course this was the most difficult pattern of all of them! I started taking out the mistake and then there was no stopping me and out it all came. I’m sort of relieved and glad I did it! I changed the ear color and the cat is all back in, except for the inner pattern, which I changed to stitching it with 2 strands instead of the 3 it called for. Much happier! So why is it not finished? Welll it’s been way tooooooooooooo hot to stitch. Way too hot as this kid has no ac in the house. 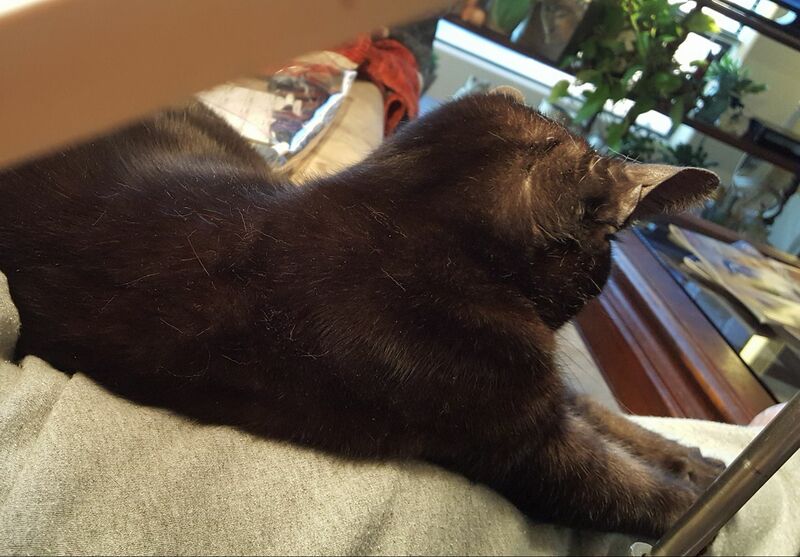 Between the heat from your stitching lamp and then if AlleyCat even thought about getting on my lap and sweaty hands which could discolor it all, well I’m just not stitching at all! Period! Now I’m getting ready for ANG seminar in Washington D.C. where there will be no shop this year in the hotel. I’ve been working extra hard pulling lots of possible threads that I might need, cause what class am I taking? Embellishment Squad class! But before I depart for seminar, Brenda Hart will be in the shop for a sold out class, so I have that to look forward to! There will be no time for a baseball game in Washington D.C. this year, and I was able to go a few years ago when our summer trade show was there. I will come right back after seminar is over for a few days, unpack and pack again, do payroll, sign checks and then off to the south of France with a small group. Tony Minieri will be teaching a specially designed piece for us! Coming back through Paris and London and home and followed up by another weekend trip. Will AlleyCat ever forgive me? This is one of her favorite poses! She loves those beverage takeout containers! Such a silly girl she is. Another Finish and an Almost! Where has the time gone to? It seems like it was just the 4th of July the other day and here it is almost 3 weeks later! I will blame it on the fact that I have been stitching up a storm these days, kind of like I used to. I make a great effort to stitch at least a few hours every night. 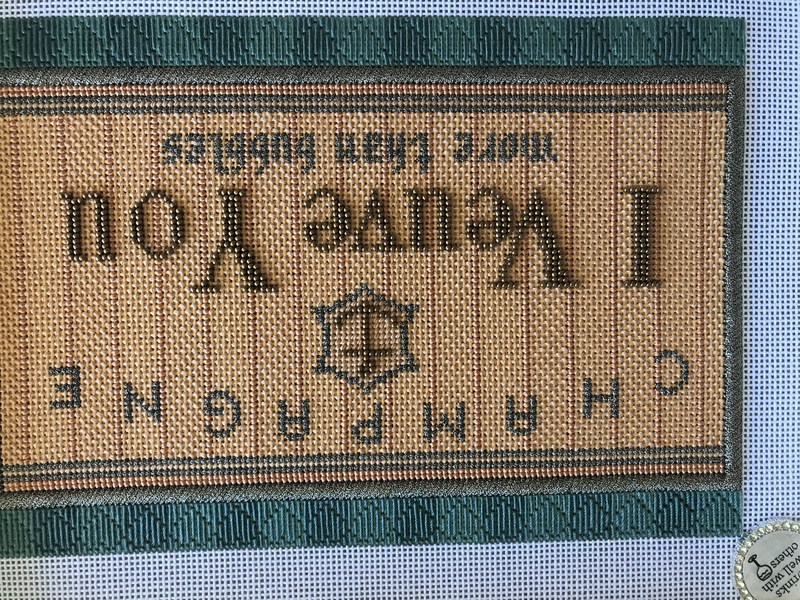 The canvas is by Thorn Alexander and I loved how she designed this of Veuve Clicquot, one of my favorite celebratory favorites. There is a fascinating book out there on the life of Madame Clicquot which I read many years ago. Maybe I need to read it again! We have sold about 5 additional canvases since people have seen it stitched! Susan Portra selected the threads and stitches for me. I did need to change a few things as either the threads did not cooperate with the decided stitch, or the canvas count didn’t agree or I just liked this better. I totally respect what these amazing teachers come up with, but you need to like the end result! It is your canvas and you need to be happy with it! And I am over the hill happy with this! I took this to my framers New Creations in San Marino and of course the frame that we selected has been discontinued, but we came up with a plan B just in case! I love the creativity of Nancy and Andrea and even though we have a framer across the street from the Needle Nook of La Jolla, I would feel like a traitor if I didn’t head up their way. This is my almost finished! which I really tried so that I could bring it along to the framers at the same time…but it wasn’t meant to be. 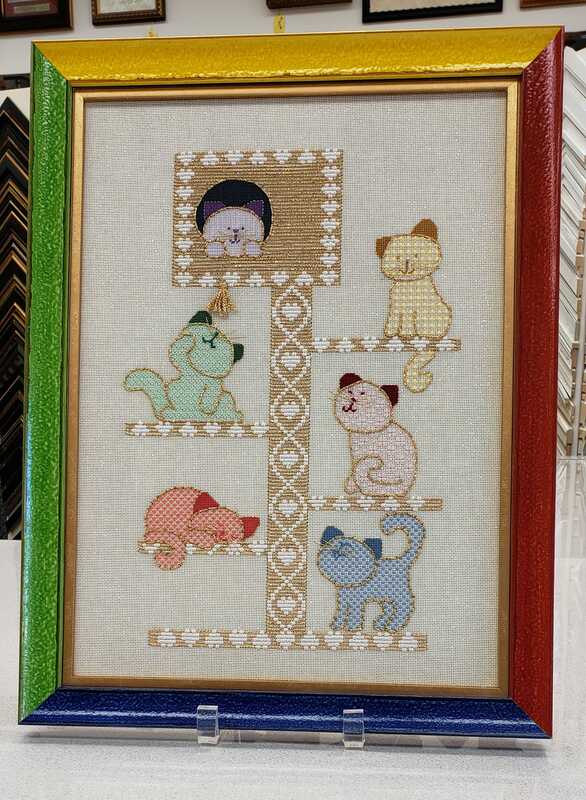 This is an older design by Chottie Alderson that I have always wanted to stitch! I was able to find this partially stitched and available for sale on Facebook Needlepoint Stash Exchange, so I grabbed it. I need to finish the pink cat, even though I’m not happy with that one…thinking about taking it out and redoing it, but that stitch was so challenging it just may stay as is! I just need to add the whiskers, outline the ears and the green kitty needs a little tassel that it ican swat! It’s going to be awhile before I check in again as there are some busy times ahead for me! Headed to Cooperstown next weekend to the Baseball Hall of Fame for the induction ceremony for Trevor Hoffman of the San Diego Padres. My jeans, hat and baseball T-shirt’s are out, I need some better sunscreen and I’m ready to go. Then Brenda Hart comes to the shop and a few days after she leaves it’s ANG seminar and then there’s more after that too. I think AlleyCat is all packed and ready to go with me!